Acne can be crippling, whether you’re in your teens or an adult. But there are natural solutions to help relieve acne symptoms without damaging the skin. Many people with acne avoid oils because they believe it will make their oiliness worse. But if you use a pure jojoba oil, acne won’t worsen – in fact, it will improve. Jojoba oil is also great for hair growth! Acne is a skin condition where bumps under the skin form. This is often followed by inflammation and even infection in the bumps, causing whiteheads, blackheads, and pimples. Repeated inflammation and infection lead to scarring of the skin. There are different types of acne, varying in the cause and severity. However, the key problems are excess sebum production, slow turnover of skin cells and clogged pores. Acne is most common in teens, as there is often a hormonal component that causes problems. However, many adults also suffer from acne. Although acne may not seem like something so bad to someone who has never had it, sufferers know different. It can have a crippling effect on self-esteem, as well as being uncomfortable and even painful for many. Although it is called an oil, jojoba oil is actually a wax ester made from jojoba seeds. These esters are almost identical to the sebum found on human skin. This similarity is key when it comes to using jojoba for skincare. Jojoba oil also contains antioxidants, vitamins, essential fatty acids and other beneficial compounds that nourish and protect the skin. It has plenty of antioxidant, anti-inflammatory and moisturizing properties that can benefit the skin. 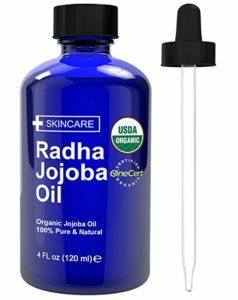 How is jojoba oil used for skin care and acne? A spot treatment for blemishes, dry patches, and irritation. This is best when a small area is in need of care. Just drop 2-3 drops onto a cotton pad, and dab onto the spot. A cleanser option when using the ‘oil cleansing method’. This method is based on the idea that oil can dissolve oil, so jojoba can work like a gentle cleanser for oily skin. Massage a few drops into the skin for a few minutes, then use a hot wet washcloth to gently wipe excess oil off. A gentle moisturizer that won’t irritate or flare skin. By using just a couple of drops, you can easily moisturize your whole face without feeling greasy or oily. Simply massage a couple of drops into the skin until absorbed. As a carrier oil for other nutrients and beneficial ingredients. This is why skin care companies use jojoba – it transports ingredients deep into the skin. However, you can also use it to make your own homemade skin care products. 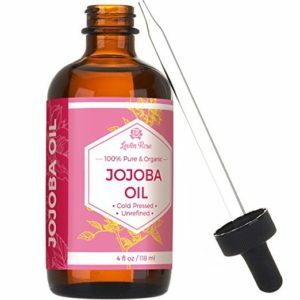 Why use jojoba oil for acne on your face or body? As we’ve seen, jojoba has different ways of working on the skin. Several of these can help when it comes to controlling breakouts and soothing acne-prone skin. 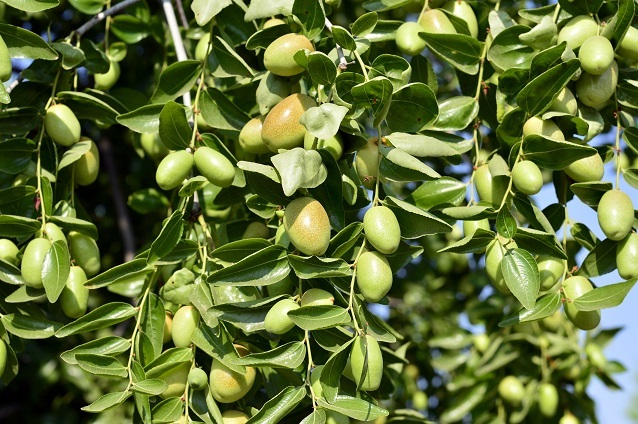 Jojoba oil has been shown to have anti-inflammatory properties. This can make it an excellent spot treatment for acute flare-ups of acne, particularly if the skin is inflamed and even infected. Jojoba’s similarity to the sebum our skin produces is thought to be key to controlling acne. It’s believed that the skin will produce less sebum if jojoba is used, as it believes it already has enough sebum. Jojoba oil deeply penetrates the skin, nourishing skin cells with essential nutrients. These healing nutrients, including antioxidants, essential fatty acids, and fat-soluble vitamins, can help address the root problems of acne. For acne associated with hormonal imbalances, jojoba may be particularly helpful. This is because jojoba contains a compound that deactivates excess testosterone, which contributes to acne and sebum production. It’s easy to see why jojoba oil is ideal for use in acne. If you want the best jojoba oil for acne, look no further. We have the best options for you right here. 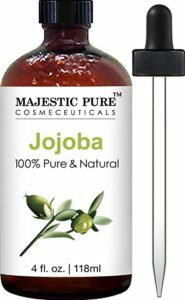 This pure jojoba oil is luscious and nourishing for your skin. It is 100% pure and certified USDA organic, so you will be giving your skin only the very best care. The bottle is tinted to protect the oil from light and oxidation, so it will last you longer. It is also unscented and has no additives or preservatives, so can be used on the most sensitive skin. Just a few drops of oil per day can transform your skin. Organic, 100% pure and natural, this oil is all about quality for your skin. With no additives or chemicals added, plus odorless and colorless, it’s ideal for sensitive skin that needs a bit of TLC. This oil will stay stable without any deterioration of the therapeutic benefits. So if you want a little bottle that will last you longer, get yourself a bottle of Majestic Pure. If you’re not happy, they offer a money-back guarantee – that’s how confident they are that you will love it! Want to heal your blemishes, reduce redness and have beautiful, soft skin? Leven Rose knows that their jojoba oil can do all this and more for you. This 100% pure and organic oil is cold-pressed and unrefined, so you’re getting all of the benefits with no nasties to hold you back. They package their oil in a dark amber glass bottle to protect the oil from damage. Their oil is fragrance-free, non-GMO and free of additives, so your skin is getting the very best nourishment in every drop. So if you’re suffering from acne, give jojoba a chance. As we see, a natural oil like jojoba won’t make your skin oilier. Instead, it will reduce inflammation, balance hormones, and dissolve excess sebum. In fact, it may just be what your skin needs in order to bounce back to health. Healthy, happy soft skin can be yours to enjoy!